When it comes to starting your own online store, Shopify is one of the best platforms out there. But the main problem with Shopify is that it can be hard to decide which Shopify pricing plan to go with or how much it costs when you factor in the cost of 3rd party apps. 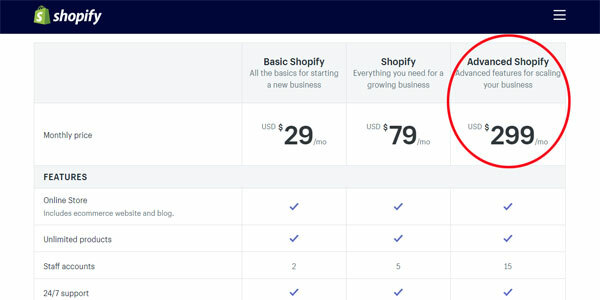 Right now, Shopify offers 5 pricing plans. 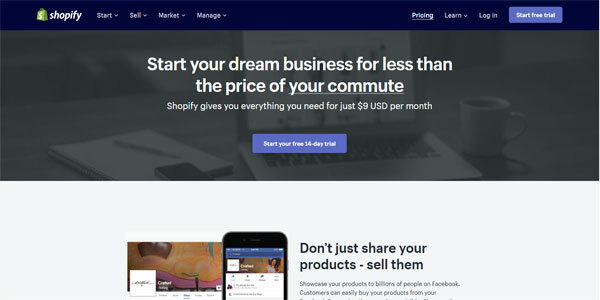 Shopify Lite – $9/month. You probably didn’t even know about this plan because it’s hidden on their pricing page. Shopify Plus – $2000+/month + 2.15% and 30¢ per transaction. Shopify’s enterprise ecommerce solution. The pricing for this plan is not advertised on the site but generally starts at $2k. The right Shopify plan for your ecommerce business depends on a variety of factors which include your monthly revenues, your required feature set and your customization needs. 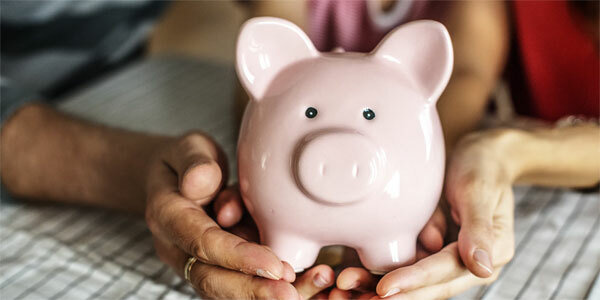 This post will enumerate all of the costs and benefits for each plan and prevent you from wasting money on unnecessary features. The ultimate goal is to help you choose the cheapest possible Shopify pricing plan that meets your requirements. The following table is from Shopify’s website and enumerates all of the features for each plan. If you look at the table above, you’ll notice a few things. First of all, the Shopify Lite plan and the Shopify Plus plan comparison tables are missing. Why? The reason is because the Shopify Plus plan and the Shopify Lite plan have very specific use cases which I’ll discuss in depth later on in this article. 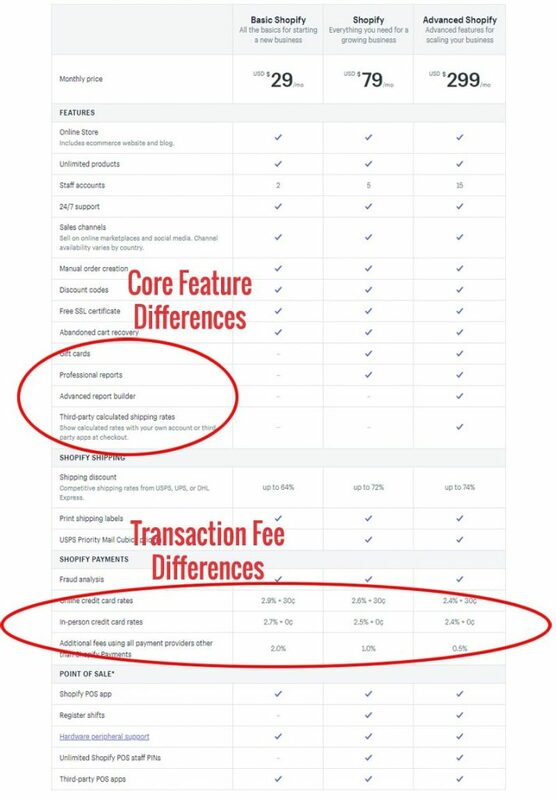 Second of all, there is very little difference between the basic, regular and advanced plans outside of a few features and processing fees. As a result, your decision between Shopify basic, regular and advanced primarily depends on your monthly sales volume and how much you value the extra features vs paying for 3rd party apps. If you run a popular blog or website and simply want to add the ability to sell a few products here and there, then the Shopify Lite plan is for you. The Shopify Lite plan costs $9/month and allows you to sell on Facebook and on your own site through the use of custom buy buttons. The important thing to realize about Shopify Lite is that this plan does NOT provide you with an online store website. In fact, the Shopify Lite plan is only for people who already have their own website and would like to accept ecommerce transactions. For example if I wanted to sell widgets on MyWifeQuitHerJob.com, I might want to sign up for the Shopify Lite plan so I could include buy buttons on my blog to sell my products. If I had a popular Facebook page or group, I might want to sign up for Shopify Lite to sell directly on Facebook. Bottom line, the Shopify Lite plan is only for people who already have a web presence and would like to accept transactions online. In addition to the $9/month fee, you will also have to pay 2.9% + $.30 per transaction if you use Shopify Payments. For most stores out there, the Shopify Basic plan makes the most economical sense until you start generating more than $16,333 in monthly revenue. Here’s how to calculate the breakeven point. The Shopify Basic Plan offers a 2.9% +$.30 transaction fee whereas the Shopify Regular Plan offers 2.6% + $.30. This is a difference of .3% on the transaction fees. 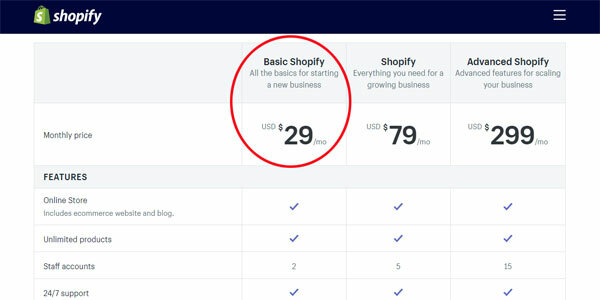 The Shopify Regular Plan costs $79 whereas the Shopify Basic Plan costs $29, a difference of $50. To make up for the $50 difference in cost, you have to process $50 / .3% = $16,333 to break even. Feature wise, the one major difference between the Shopify Regular plan and the Shopify Basic plan is that the regular plan offers gift cards and professional reports. At first glance, the lack of gift card capability sounds like a deal breaker but there are many Shopify 3rd party apps that will implement this functionality for you. For example, the Bold Discount App offers a very powerful discount engine for only $14.99/month. While the “professional reports” you get with the regular plan are useful, they alone do not justify the added $50 cost of the regular plan. At this revenue range, you should sign up for the Shopify Regular plan. In fact feature wise, there is almost zero reason to sign up for the Shopify Advanced plan until you exceed $110K/month. If you look at the Shopify Regular plan, you get 99% of the Shopify features for only $79 which makes this plan the sweet spot for most 6 and low 7 figure online store owners. You want to show calculated shipping rates at checkout – In my experience, showing the exact shipping rate during checkout is overrated. But for some businesses, this feature might be important. At this revenue tier, it’s in your best interests to stick with the Shopify Advanced plan. The advanced plan offers the lowest transaction fees of all the main plans including a few extra “nice to have” features. For example at this revenue level, you’re probably already handling your shipping via a third party vendor. As a result, it might be nice to show your calculated rates during checkout instead of using a table rate or flat rate solution. If you don’t have a bookkeeper or an analytics member on your staff, Shopify’s advanced reports will come in handy for projecting your future revenues. But outside of that, you should stick with Shopify Advanced until you hit $680K/month in revenue or if you require the advanced feature set of Shopify Plus. At this revenue level, it makes sense to sign up for Shopify Plus just for the transaction fee savings alone! At this tier, your credit card processing fees plummet to only 2.15% which is on par with what you can get with a regular merchant account and gateway combo. But outside of the pure transaction fee savings, Shopify Plus also offers you a host of advanced features that are extremely useful and unique to Plus users. This feature is very convenient if you sell in international markets. With Shopify Plus, you can have up to 10 stores at no additional cost where you can tailor the products and content to whatever country you are selling into. Launchpad is a tool only available to Shopify Plus merchants that lets users automate common ecommerce tasks related to promotions and sales. For example, you can automatically adjust your prices during a promotional campaign based on specific product parameters. You can set complex rules for discounts such as a free gift with purchase or free shipping based on the type of product ordered. You can also set a start and end time for a special sale and automatically change your theme with special colors and images and immediately revert it back after the campaign is over. Meanwhile, Shopify allows you to monitor your launch campaigns in real time with their event dashboard. One of Shopify’s glaring weaknesses is the ability to offer special wholesale pricing to select customers. But Shopify Plus adds this capability out of the box. The Shopify Plus Wholesale Channel allows you to create a separate storefront specifically for your wholesale customers that is an extension of your existing ecommerce store. Especially if you sell in retail locations, you can effectively streamline your sales channels and merge your inventory tracking for your entire operation. One of the biggest advantages of using Shopify is that you don’t need to know how to code your own website. But once your store reaches a certain size, you’ll probably have customization needs that extend beyond the regular Shopify plan. For example, regular Shopify plans do not allow you to alter the checkout experience. But Shopify Plus customers can create any custom checkout implementation that they want. In my opinion, access to Shopify Flow is probably the biggest benefit to upgrading to Shopify Plus aside from the cost benefits. Shopify Flow is Shopify’s backend automation platform that allows you to setup custom workflows. For example, let’s say I want to automatically track and tag specific customers who purchased widget A and B together. With Shopify Flow, you can easily setup an automated workflow to tag these customers and use this data to generate highly segmented reports or to setup Facebook custom audiences. You can also export these customers into special segments for your email marketing provider. Another popular use case for Shopify Flow is to automatically implement loyalty and retention discounts by segmenting customers with tags based on their lifetime spend amount. You can even use Shopify Flow to send a staff member a Slack message whenever a high LTV customer is shopping in your store. Overall, Shopify Flow allows you to take specific actions based on internal events that run in your store, and the possibilities are limitless. 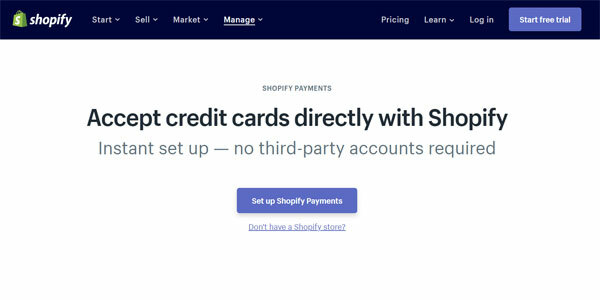 One of the perks of signing up for Shopify is that they give you the ability to process credit cards right out of the box without the need for a 3rd party provider. Their payment processing solution is called Shopify Payments and it’s very convenient for new online store owners. However, the downside to Shopify Payments is that it’s a lot more expensive than almost every 3rd party credit card processor out there. For example, a store that makes 10K/month can probably get a 2.2% credit processing fee from Authorize.net whereas Shopify charges 2.9%. If you can find cheaper credit card rates elsewhere, then why would you stick with Shopify Payments? The reason is because Shopify charges a transaction fee if you DO NOT use their payment platform. This transaction fee starts at 2% for the basic plan and drops to .5% on the advanced plan. Bottom line, Shopify essentially forces you to use their payment platform. The unfortunate reality of using Shopify is that their base shopping cart has very few features out of the box. As a result, most Shopify users end up paying for 3rd party apps that extend Shopify’s functionality. The majority of apps in Shopify’s app store carry a monthly recurring fee and these costs must be taken into account when you calculate that overall price of Shopify. In fact, it is not unusual for ecommerce store owners to pay hundreds of dollars per month for apps on top of Shopify’s base plan. My advice to you when it comes to shopping for apps, is to only pay for apps that definitively contribute to your bottom line. 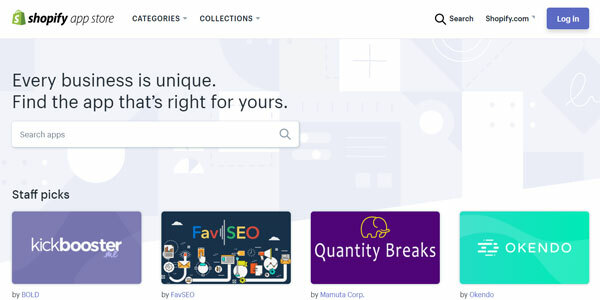 Even though Shopify handles most of the heavy lifting for your online store website, there are a few additional costs that you still have to worry about. For one thing, Shopify does NOT provide you with a free domain. To register your own domain, Shopify will charge you $9 per year but in general you should host all of your website domains at a neutral 3rd party registrar like Go Daddy or NameCheap. In addition, Shopify does not provide you with the capability to send email from your own custom domain out of the box either. Instead, if you want to send email under yourdomain.com, you’ll need to sign up for an email provider like Zoho Mail or GSuite. The easiest way to save money on Shopify is to pay for a year upfront vs paying month to month. Shopify does not advertise this on their website, but you can save up to 25% if you choose to pay for 3 years in advance. In fact, here’s how the discount typically works. You can save 25% if you pay for 3 years in advance. If you plan on sticking with Shopify in the long run, then it’s in your best interests to pay for as much upfront as you possibly can. If you are on a month to month plan, you can cancel at any time but it will be significantly more expensive. Note:Shopify Plus requires at least a 1 year commitment to join. 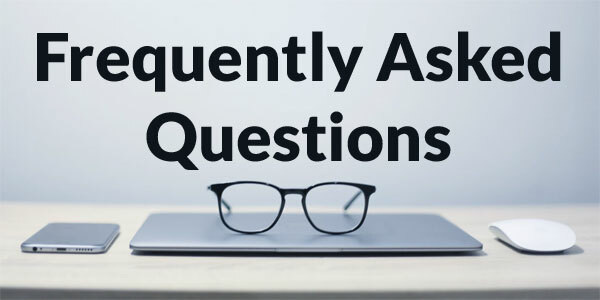 Here are the most commonly asked questions I get about Shopify. How much does a typical Shopify plan cost INCLUDING apps? I’ve already covered the costs of the different Shopify plans: Basic, Regular, Advanced and Plus. However, the cost of your Shopify plan is often just a small fraction of the total cost of running Shopify because of 3rd party apps. Now the total number of apps that your store will need will vary depending on the nature of your products and your ecommerce store. But the majority of my students making at least 5 figures per month in my Create A Profitable Online Store course pay over $150/month on apps alone. Does Shopify have transaction fees? The term “transaction fee” can have many definitions and you can argue that Shopify Payments is a transaction fee all by itself. But if we use Shopify’s terminology, transaction fees are only incurred if you do NOT use Shopify Payments. These transactions fees start at 2% for the basic plan and drop all the way down to .5% for the advanced plan. In most cases, these transaction fees pretty much force you to use Shopify Payments. Does Shopify charge For Shopify Payments? There is no monthly charge for Shopify Payments and you can start accepting credit cards right out of the box for free. The downside is that the fees for Shopify Payments are much higher than you can get from a 3rd party processor. How Does Shopify Compare Vs BigCommerce Vs WooCommerce Vs Open Cart? 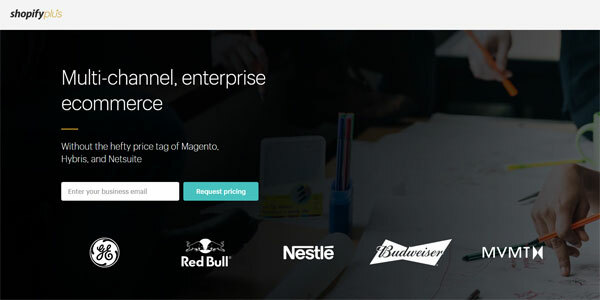 If you want to know the pros and cons of the most popular shopping carts on the market, I wrote 2 comprehensive posts that will help you decide between Shopify, BigCommerce and free open source platforms like WooCommerce and Open Cart. Can Shopify Handle Massive Traffic Spikes? There are no restrictions on traffic, sales or visitors for any Shopify plan. In fact, the primary benefit of using Shopify is that you don’t have to worry about maintaining your own server. Shopify handles everything for you. 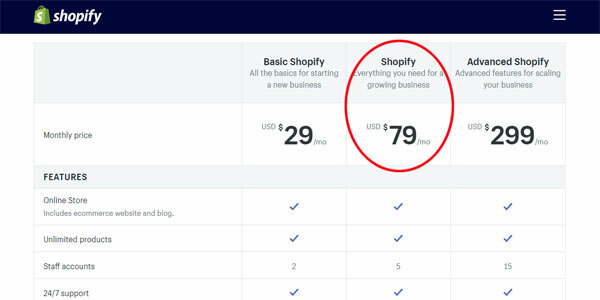 Overall, Shopify’s pricing plans can get quite confusing if you don’t have any hands on experience with the platform. 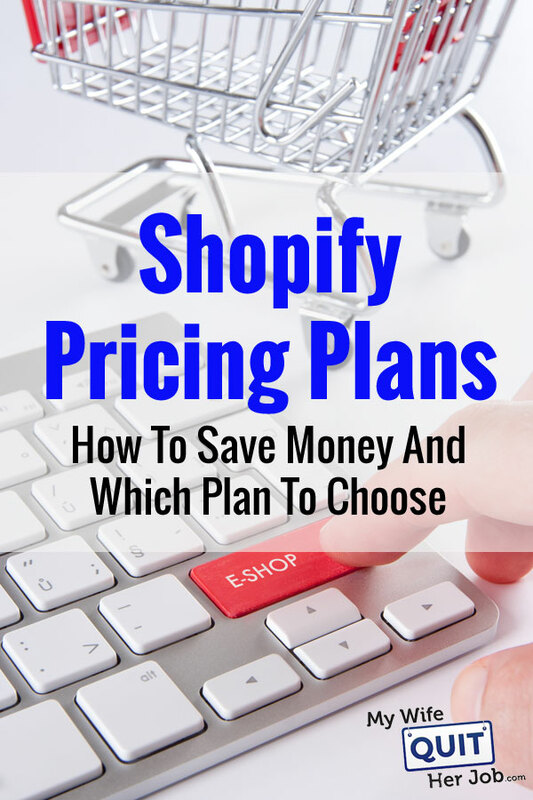 In practice, it’s in your best interests to stay on the cheapest Shopify plan possible until your credit card rate savings exceed the cost of the next higher plan. Outside of the Shopify Plus tier, the features you get for each higher plan are mostly a non factor. After all, most of the extra functionality with Shopify will be gained from paying for 3rd party apps. The base Shopify cart will never do everything you want it to do. What are your thoughts on Shopify Payments? I’ve read good and bad so haven’t made the jump yet. Great insight on the breakdown of Shopify plans. I had upgraded to the $79 Shopify plan before the holidays in 2018 to be able to create gift cards. I am well under $16k in monthly sales on Shopify so I was thinking about going back to the Basic plan. However, I then realize that Shopify now only allows 2 users with the Basic plan and need at least 4-5, and that is a concern now. I can lump most users into those 2 user accounts. Just not sure how secure that is when trying to track actions. Any thoughts on this? First of All I Thanks to Write a Wonderful Article. Shopify causes you by giving quality associations at coordinate rates. In the event that you adjust it with different stages, you need to pay a lower month to month cost and get most uncommon associations in lieu of that. In any case, I at that point understand that Shopify now just permits two clients with the Basic arrangement and need no less than five, and that is a worry now.